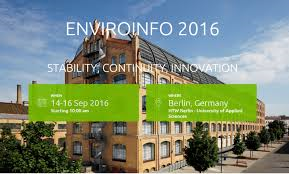 The EnviroInfo 2016 is the 30th edition of the long standing and established international and interdisciplinary conference series on leading environmental information and communication technologies. The 2016 conference will be held in Berlin on 14-16 September 2016. Together with the European Environment Agency, the Faculty of Science of the University of Lisbon and the Council of the Baltic Sea States Secretariat, Thetis will organise the workshop “Adaptation knowledge platforms – approaches for presenting complex information”. This workshop will aim to present new developments of Climate-ADAPT the European Climate Adaptation Platform and capture feedbacks from environmental information experts. Thetis, as partner of the European Topic Centre on Climate Change Impacts Vulnerability and Adaptation (ETC-CCA), contributes to the evolution of the platform and the elaboration of its contents.